How to Create Passive Income from Rental Properties: Will the New MRT Line Increase Property Prices Significantly? Will the New MRT Line Increase Property Prices Significantly? At first I thought it was a rather strange question to ask, since the RM30bn project has been much talked about, and received much attention in the media. The new 55km line which runs from Kajang in the south to Sungai Buloh in the north is expected to bring much new business to the areas which it runs through. In the discussion sessions with the authorities though, some groups have been lobbying to have the station in their develeopment area like in Damansara Uptown, while others like the residents of Taman Tun Dr Ismail (TTDI) are arguing against having the station in their area. The detractors argue that the new line unless its underground would be unsightly and may bring down property value (instead of improving it!). According to my friend who is well versed on infrastructure project: going underground would increase the construction costs (by many folds) - but the advantage, of course is that, it is less disruptive & less unsightly especially in highly densed areas like in Bukit Damansara (yes, its not just because many prominent people live there, incl ministers, who do not want to see the property values affected by noisy trains!). So, I started giving this question some serious thought. Will having the new MRT line running through your area really increase the value of your property? I guess, it all depends. When was the last time you took a ride on the current MRT? I mean not just for short ride but to get to work or even to go shopping? I have to admit that most of my MRT rides have been from Bandaraya station to Masjid Jamek (1 stop) or sometimes to KLCC (3 or 4 stops), for lunch. That's simply because- I have a car and drive. The sad fact is that most Malaysians especially in KL drive, and those that take public transport tend to be middle to lower income earners, who may not have cars. And of course, there are the retirees who find it convinient to travel during off peak hours, and enjoying senior citizen discounts. And oh, yes the foreign workers also use the MRT. For residential areas - my opinion, is that the new MRT line will improve the value of property around the area - provided the development is targeted at the middle-to-lower income segments. In which case, link houses, and flats which are affordable, near the new stations would benefit (below 250k). We have seen examples of this phenomenon in established areas like Taman Miharja, Cheras (LRT line), Wangsa Maju, and Taman Melati. The flats and houses are in high demand - rental in these areas tend to exceed the other areas due to the proximity to the station. People who work in the city and have no cars don't mind paying a little bit more for convinience. Of course, other factors like access to amenities like shops, food courts, and schools also play a big part in their appeal. But, I feel that the over riding factor is that that the property around the MRT area need to be affordable and within their reach. This brings us to the situation we are in today: the new MRT line will run through TTDI, The Curve, Bukit Damansara, Ara Damansara which can be regarded as well established areas, and where property prices are already high compared to other areas. How much more can it go up? It is unlikley that people with cars and drive to work will suddenly be keen to take the MRT now the new line is there. Also, even less likely would be people who are earning less than 5k a month (and having less than 1k to spend on housing) would suddenly be buying or renting condos in Mutiara Damansara, just because the MRT station is next door. And given that land prices in these areas have skyrocketed, a 250k link house would be a dream. It is just not going to be profitable to developers who own land around the future MRT stations to be building link houses costing 250k and below. The high land prices would just not permit this to happen. So in the end, we will probably (for residential) see more high end condos, and super link or semi detach houses being built to justify the high land prices: probably not what is demanded by the likely users of the new MRT line. But in any case, developers and the agents will be carrying on, promoting the merits of having the MRT station next door to your new property. And that prices will escallate once its built. Of course, some of us will be tempted to buy these new property, but be warned: remember, who will be main users of the MRT? Unlike Hong Kong and Singapore which are high income nations, and riding public transport such as MRT is the norm, in Malaysia, the likely winners of the development may be areas that have affordable housing already in place - and existing property that will be enhanced by the new MRT line. This is a more plausible scenario compared to the "new" property developments having high potential gains because of the MRT. Finally, perhaps the "smart/ old money" in TTDI or Damansara know something the rest of us don't? That the new MRT line is not necessary a boon to all that it pass through. And in some cases, it may even be a bane to them due to noise pollution, indiscrimate parking or perhaps just drawing in the "wrong" crowd to the right neighbourhood? Food for thought. Happy CNY. A very well written insightful piece. And so very correct. The MRT alignment is really sub optimal. Not targeting areas that need it the most but building it just fir the sake of running a line from point a to z.
Bukit damansara and ttdi are residential areas which are already developed. Putting an elevated line across these old areas are really very disruptive and will have a negative affect on the properties. It's really very questionable, this KVMRT line! Sigh. 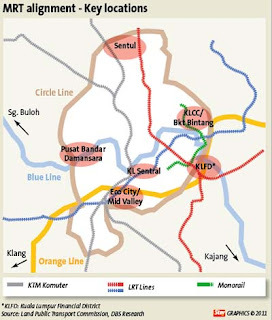 Klang Valley MRT is a boon for big developers. 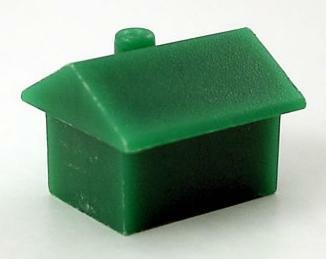 But My First Home, with 100% financing is a bonus for the smaller developers.